From a WordPress developer’s point of view, a solid plugin directory is valued as pure gold. You can have a full database with a ton of plugins and still use just, let’s say, 30 of them. It might seem odd to you, but a great plugin database does not need to consist out of a great volume of plugins. Having a solid number of multipurpose or single-target responsive plugins can generally bring ease and speed up your work. Keep in mind that it is important to categorize your plugin database for various usages in order to avoid getting lost. WordPress is one of the most popular CMSs (Content Management Systems) in the world. Its growing community of users now counts over 35 million users, developers and designers, compared to just a few people, back when it was initially released in June 2003. WordPress was, in its initial form, just a simple typography tool consisted of a few lines of short-code, developed to help bloggers in their work. Now, after ten years of hard work by its active community, WordPress has evolved into a beautiful, open-source content management system. Conventional PHP programming can be hard work if started from scratch. For every function you intend to implement on the specific website you are working on, you will need to type lines and lines of code and please, don’t get me started on the design. It is extremely tedious and boring when you have to program the whole gallery for a website with lines upon lines of code. This is where WordPress wins the race. It allows you to download and install plugins in a matter of minutes and completely customize it to suite your needs in less than an hour. Its extremely user-friendly interface allows you to set up the whole website without any exceptional knowledge in CSS and HTML programming. I have prepared a deeper review of several great WordPress plugins and you might just find a valuable jewel for your plugin collection so, stick around. This beautiful plugin represents a grid layout for your WordPress website. In its initial release, uSquare was released for jQuery but later on, exactly because of the influence of the community, it was soon launched in a WordPress version. It made a powerful boom on the market because of its multiple features and its possibility to adapt to any form of WordPress website. “Products and Services” page – to present your work. Each square consists of two boxes. One is reserved for an image file while the other is focused on the title and the description. The whole grid layout resembles a chess board and it is easy to focus and arrange. You can add up an infinite number of squares (depending on your computer, server and website optimization power); however, there can be a problem when you are opening a grid consisting of 90 squares in Internet Explorer 8. 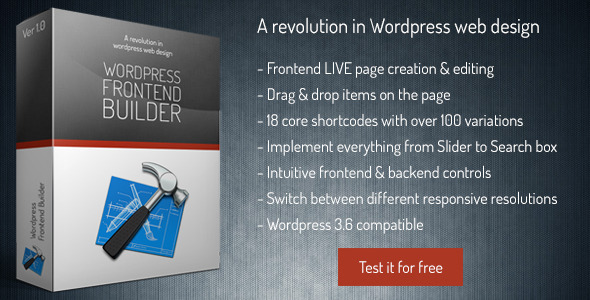 Although this plugin looks quite simple, it has a powerful back-end behind it. The authors have included option panels for various devices from laptop and desktop computers to small devices with retina displays such as tablets and smartphones with the Android and the iOS platform. This enables the whole grid to be responsive and easily adapt to all types and dimensions of displays. Given the fact that it is clean-coded, it also makes everything SEO (Search Engine Optimization) friendly. uSquare has great typography features built-in. Aside from the 600 Google fonts from which you can choose, you can also add color customization using an endless color palette. These customizations can be applied to the title, description, content body and info label. The rest depends on your creativity. You can implement social share buttons for various social networks such as Facebook, Twitter, LinkedIn, Pinterest, Instagram, as well as more buttons which can be connected to the official website or an email contact. Another great thing is that you can add additional icons to the bottom of an expanded square, which can be connected to any link you wish. This is very useful if you are trying to connect your team member to his or her posts on the website. It helps you build up a personal portfolio and it allows your visitors to quick-jump through content of your website. For more information about the authors, you can check out their profile on CodeCanyon or visit their official website. If you are building a corporate or news WordPress website, a newsletter should be your main focus. Think of it this way: burst-emailing is an important factor in various online marketing campaigns. In order to inform and attract potential customers/readers, you will need to engage this strategy without it exploding back to your face. In “General Options,” you can set up basic information about the newsletter such as name and address of the sender, reply address, sending delay and newsletter template (email form). When it comes to frontend settings, you are given an option to allow sharing of your newsletter on various social networks such as Twitter, Facebook, Google+, etc. This is a very useful option, being that your newsletters can be seen by more users and you can attract more potential customers/readers. You are given an option to double check the subscription which can be toggled on or off. By enabling it, your subscribers would have to confirm their subscription via email. Improve your online marketing campaign – you can do this by spreading the circle of potential customers with great interest for your products and services by having more hits than misses. Email marketing plays a great role in an online marketing strategy and if properly executed, it will not only raise traffic of your website and maintain your online presence, but it will also reflect on your business.The greatest thing about this plugin is that you can schedule, modify and execute a newsletter campaign with ease and with great efficiency. 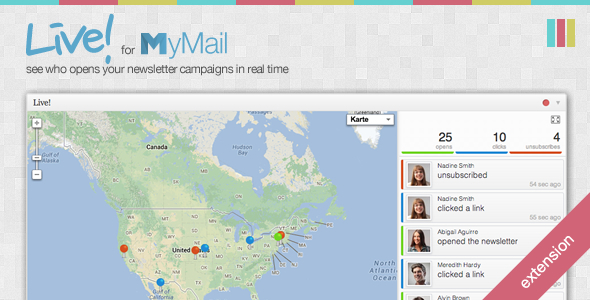 More information about MyMail, as well as the author’s portfolio can be found on codecanyone.net. The author is offering great support and will answer all of your questions in short notice. Sliders have become a trademark of every WordPress website. They are a great way of promoting your products, services and portfolios. They bring a great visual background and their interactivity beautifies the whole website design. Currently, there are a lot of slider plugins for the WordPress platform; however, there are not many among them with the same efficiency/visual ratio as Slider Pro. The skins are highly customizable so you can redesign them to suit your needs. You can embed any content into the slider, from pictures in different layers to videos to posts from your website. Slides can be browsed using the keyboard arrows–the simpler, the better. Now, a beautiful thing about this slider is that you can opt between 100 transition effects such as swipe, fade, slide, etc. There are over 150 customization options for this beautiful plugin, but instead of downloading stacks of documentation for setup and customization, the authors have implemented rich inline help, which will follow you through the whole installation process, making everything far, far easier. You can toggle the automatic slide on and off, depending on the content you wish to present to your visitors. Aside from this, you have complete control over the transition effect of each slide. The “Lazy Loading” feature enables you to control the number of pictures that will be loaded in order to lower the resources which every page pulls from the server, thus increasing its load speed. Slider Pro is developed in HTML5 and exactly because of its clean coding, it is extra SEO friendly. If you wish to move the slider at any time it is good to know that the whole animation can be exported and moved to another website in just a few simple short steps. This is what makes this plugin beautiful–it is minimalistic, clean, highly customizable, responsive, and it finds its use in any type of WordPress website. 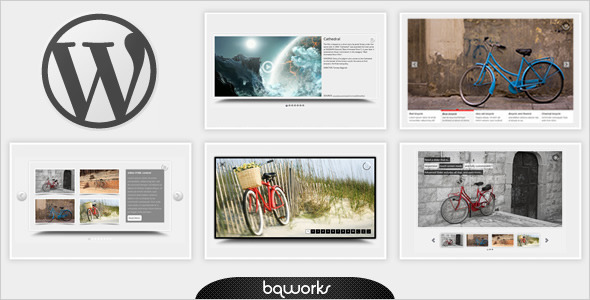 If you wish to see more projects by BQ Works, you can visit their official website. This plugin is entirely user-friendly and responsive, and it actually gives you the best solution to setup your website as quickly as possible. You can assign it to any theme built for WordPress versions 3.4 – 3.6 and it will keep its stability and efficiency. It is designed in a wonderful way, so you will be able to do all this very easily and without fear of messing up the code. A good thing about all of these elements is that each has a unique set of options for customization. You will have a large number of customization varieties because each of the elements has from five to twenty customization options. If you know how to utilize all of them properly, you will be able to create a unique design for the website you have and the website will be fully responsive and SEO friendly as well. You can simply drag-and-drop the elements to the page and you won’t have to worry about their position. You can put them anywhere you like, but it is advisable to follow some rules in design, and not just do it the way it seems nice. For each element you choose, you will have a sidebar with all customization options for the element in question. The options are, of course, different for each element. If you need any information about the plugin, it won’t be a problem for you to submit a question on their support forum. The following documentation, as well as its changelog, can be found here. This makes my top list of the most popular and most useful plugins found on the market today, based on their reviews, comments, sales and popularity, as well as my own personal review. As I already said, behind every good WordPress developer hides a wealthy and valuable plugin directory. Have you found any valuable jewels for your collection in this article?